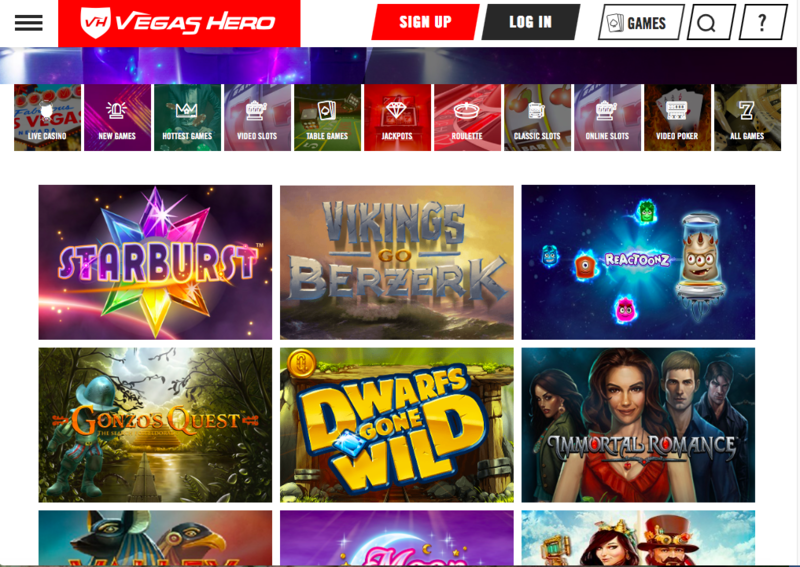 Vegas Hero is a site that comes from Genesis Global Limited, an up and coming operator that has released a number of impressive online casinos in recent times, and then it got to Vegas Hero, and seemingly gave up a little bit. A site that gives a good impression of itself at first glance, Vegas Hero’s façade quickly starts to wipe away with a little elbow grease, and what’s left is a sit dripping with potential, but doing very little to capitalise on that in any way at all. Vegas Hero is quite a new site, but it isn’t brand-new, not new enough for the lack of time in the online casino world to be an excuse for the lacklustre effort that appears to have been made outside of the aspects clearly designed to get the attention. While gaining the eye of players is important, it’s maintaining it that matters, and Vegas Hero doesn’t seem capable. 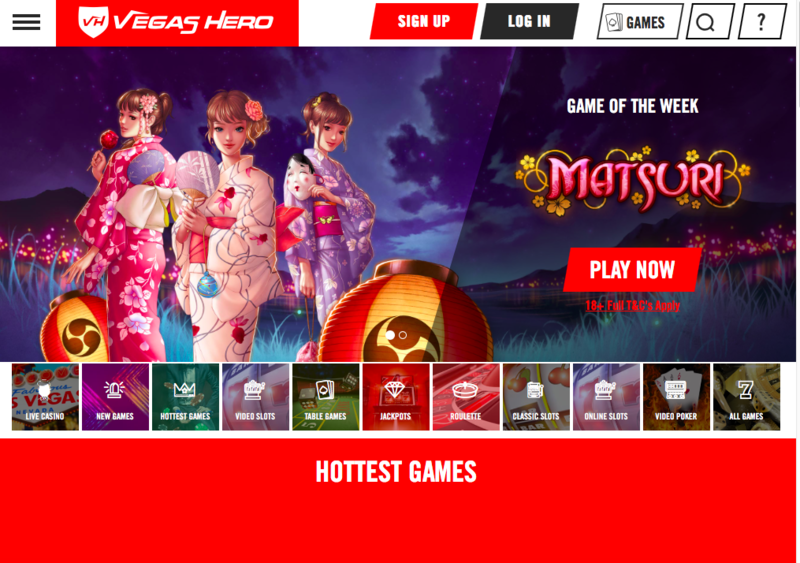 At first glance, Vegas Hero seems like an excellent looking online casino, and, at first glance, it is. The banner at the top of the homepage brings the suggested superhero theme to life, with a man in a suit taking a recognisable superhero pose in front of various Vegas landmarks, to really hammer home the title. In a world where superhero themes are absolutely everywhere, it’s nice to see an online casino doing something a little different with the concept, and if there was any more of that, it’d be great, but there isn’t. After creating this banner, it is apparent that the designers considered that to be enough, and instead of continuing this unique theme, they simply just whacked a white background and limited design work on the rest of the site. While the thumbnails on the homepage do a good job of assisting when it comes to navigation, and add some colour to the otherwise sparse design below the banner, it isn’t enough, because we’ve seen it all before, and we’ve often, if not usually seen it done better. Vegas Hero is not afraid to be boastful, and the fact that there’s well over 1,000 games available here is something they crow about at every possible opportunity, and they should, it’s undoubtedly impressive. However, there is an odd flip side to that coin, while Vegas Hero has enough games to challenge even the biggest and most established sites, when it comes to software developers, that changes quite a lot. While you may be expecting a list of 20 plus developer providing all those games, what you in fact get is literally just the heavy hitters, Evolution, Microgaming, NetEnt, Play'n GO, Quickspin, SG Digital, and Yggdrasil. While these are undoubtedly amongst the very best in the industry, the lack of any smaller, up and coming developers, those who are developing cult followings, means that while there are a lot of games available here, the variety isn’t actually as impressive as Vegas Hero may lead you to believe. All in all, Vegas Hero is a fairly large waste of potential, making an excellent first impression, and that seemingly being happy to stand back and watch that fade away as they offer nothing else beyond that first impression.